Vikings running back Matt Asiata finished with 14 carries for 115 yards in the win over the Lions. 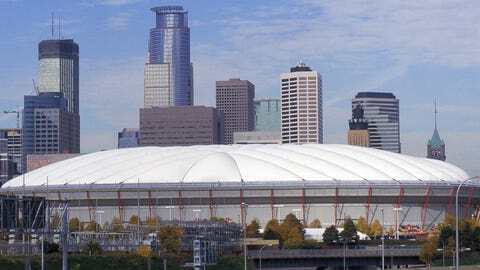 The Metrodome was sent off to its eventual demise with a Minnesota Vikings win on Sunday. Minnesota’s 14-13 win on Sunday was just what everyone associated with the Vikings wanted, excepting the season-ending 5-10-1 record, no chance for the playoffs and the future of coach Leslie Frazier in doubt. Minnesota lacked many big plays offensively on Sunday, particularly from the passing game. Matt Cassel was 20 of 33 for 189 yards passing. He threw the late touchdown to Cordarrelle Patterson to give the Vikings the win, but also threw an interception in the end zone. Making just enough plays was what Sunday was about. The Detroit Lions were in the midst of losing six of their final seven games of the season and looked disinterested. Patterson’s touchdown was one of just two catches. Greg Jennings had five catches for 44 yards. Chase Ford, with Rhett Ellison leaving the game, was the only option at tight end and had five catches for 43 yards. Cassel wasn’t great on Sunday, but he did enough. He had four passes batted down at the line of scrimmage Sunday, a season-long problem, and the offense was 3 of 11 on third downs. Cassel finished with a 73.9 quarterback rating in the game and was a part of every Minnesota victory this season. No Adrian Peterson, no Toby Gerhart, apparently no problem for the Vikings. For the second time this season, Matt Asiata stepped in with Peterson and Gerhart injured. Previously, he had scored three touchdowns and grinded out yards in a win at home against Philadelphia. Sunday, he took advantage of some big holes from the offensive line. Asiata had his first 100-yard rushing day in the NFL, finishing with 14 carries for 115 yards. His final carry, his longest at 39 yards, essentially clinched the victory, allowing Minnesota to run out the clock. There’s no doubting Peterson’s value to the Vikings, but Asiata has shown that capable backups are behind the league’s best running back. Adding to a 174-yard rushing day for Minnesota as a team was Patterson’s third rushing touchdown of the season. Patterson took a handoff on another option pass and looked downfield for Jennings. And just like he did earlier this season, instead of passing, Patterson tucked the ball and weaved through traffic for a 50-yard touchdown. It was the longest run by a receiver in Vikings history. Detroit quarterback Matthew Stafford has had his good and bad moments against Minnesota’s usually overmatched secondary. Sunday was one of his least impactful days. Stafford was sacked five times, with Jared Allen accounting for two sacks. Stafford finished 22 of 33 for 217 passing yards. He gave the Lions some second-half life, but ultimately Detroit’s offense was stopped by a Vikings defense playing for pride and trying to avoid the franchise record for points allowed in a season. Stafford was without his top target, receiver Calvin Johnson, which surely played into the success of Minnesota’s defense. With the Vikings still playing for something — personal pride, the closing of the Metrodome and coach Leslie Frazier’s job — the Lions mustered just 56 yards of offense in the first half. Detroit finished with 245 total yards, the lowest total allowed by Minnesota this season. The 13 points allowed were the least this season by the Vikings’ defense, as well, which avoided setting a new franchise record for most points allowed. Reggie Bush, by run and pass, manhandled the Minnesota defense in the first meeting this season. He had little to say on Sunday. He did score Detroit’s only touchdown, on a 19-yard reception in which he broke a tackle, but Bush finished with 65 total yards after accounting for 90 yards rushing and 101 yards receiving in the first meeting. Bush had 14 carries for 32 yards on Sunday, giving the Lions little chance offensively to sustain drives. Joique Bell had eight carries for 31 yards and Detroit was 5 of 15 on third downs. The Vikings’ returners, Cordarrelle Patterson and Marcus Sherels, each got their team records. Patterson nearly missed his chance for his. On the opening kickoff, Patterson was facing the stands and trying to pump up the fans when he missed the kickoff, which ended in a touchback by Ford. But Patterson got his chance, and his four yards, later. With three returns for 51 yards, Patterson finished off his league-leading season and established a new Minnesota record for kickoff return yardage. Marcus Sherels already had garnered enough to establish a new Vikings record for average yards per punt return, but needed one more return to qualify for the record. He got his one return, and did a lot with it. His 50-yard return helped set up Minnesota’s offense at the 8-yard line and led to the game-winning touchdown. Punter Jeff Locke averaged 39.3 net yards per punt and Blair Walsh had touchbacks on two of three kickoffs, giving Detroit’s returners few opportunities. But the focus wasn’t on Sunday’s game. It really was about the future of the franchise. A final regular-season game with two non-playoff teams lacked any excitement. Minnesota came away with the win, a few records and good health, but change is coming after another lost season. Frazier was fired early Monday. The players’ fought to the end for their coach, but Sunday’s game is going to be just a small footnote in Vikings history.